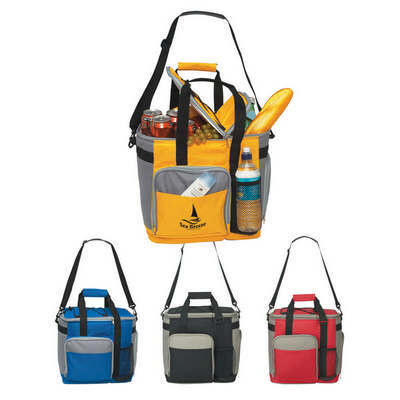 The Large Insulated Kooler Tote is ideal for use at outdoor parties, or outdoor office seminars, or at beach resorts, bringing attention to your company and your logo, in a subtle manner. The cooler bag is made from 600D polyester material, with PEVA lining. The Large Insulated Kooler Tote is ideal for use at outdoor parties, or outdoor office seminars, or at beach resorts, bringing attention to your company and your logo, in a subtle manner. The cooler bag is made from 600D polyester material, with PEVA lining. It is insulated to keep the contents at optimum temperature. The bag is roomy and can hold up to 24 beverage cans. It has two separate insulated compartments for you to separate hard and soft drinks if necessary. There is a removable liner, for easy cleaning. A detachable/adjustable padded shoulder strap makes it easy to carry. Screen print your brand logo and tag line to create brand awareness.